To introduce the use of variable DC supplies. To review the use of the function generator. To introduce plots of IV curves. To expand the use of SPICE circuit simulation to include DC sweeps. To compare results of measurement, and simulation. In this lab and the one that follows, you're not going to do Kirchhoff's analysis of the circuits, and you aren't going to use both the digital meter and the oscilloscope for all of the same measurements. Instead, circuit measurements can use whatever instrument is appropriate, and the comparisons will only be between the measurements and the simulation values. Often you want to plot I-V curves for devices for circuits. Do a transient analysis, and plot voltage versus current instead of versus time. Do a DC sweep of the voltage, and plot voltage versus current. Measure the resistance with the digital meter. Read Checking Diodes, and test the diode in forward and reverse directions. Could you tell which direction was forward biased by measurements alone? Demonstrate and explain diode checking to the lab instructor. Build the circuit, and determine the diode current and voltage over the range stated above. 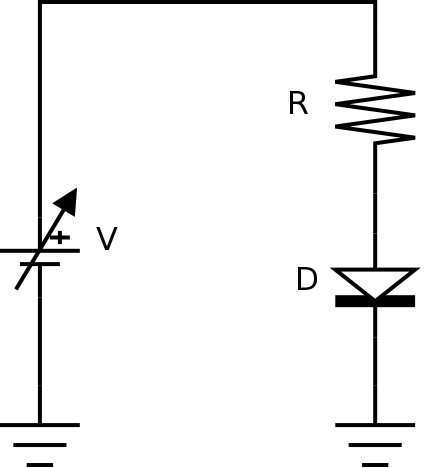 Make an I-V curve of the diode using your measurements. Replace the DC supply with a sine wave from -10 to +10 V (or as close as you can get to that) at a frequency of 1 kHz. Observe the diode voltage with the oscilloscope. Summarize the operation of the diode, given what you know about diodes. SPICE can do many different types of circuit analysis. Use the information in our LTspice tutorial to do a DC sweep. The actual diode you'll be using isn't included in the LTspice libraries, so you'll have to use the information on adding a model in LTspice to add a model to the SPICE library. (There are three different methods shown; use whichever one works.) Method 3 may be the easiest. If you have another diode in the 1N400x family, where x is a digit, you can use it but you'll need to find out what the difference is between the members of the 1N400x family, and whether that should affect what you need to do in this lab. Do a DC sweep, and from the DC sweep, plot the diode current versus the diode voltage to compare with the graph above. Do a transient (or time domain) analysis to produce a graph of voltage across the diode versus time to compare with the sketch and the DC sweep from above. Save your circuit and your LTspice files (or CircuitLab project) for future use.